The world has been shocked by the terrible coal mining disaster at Soma in Turkey. It seems incredible in 2014 that hundreds can be lost in a colliery catastrophe. My mind went back to a small Welsh village called Senghenydd, scene of Britain’s worst ever mining disaster in October 1913, which killed 439 men and boys and a rescuer. The tragedy came 12 years after 81 men died in an explosion at the same Universal pit. How could such a small community cope with such grief? But in those days – to the mine owners – life was cheap. British mining later became relatively safer, but as recently as 1960 45 men and boys died at Six Bells colliery in Monmouthshire. As a boy, I always thought of Senghenydd’s tragic past whenever we drove up the Aber valley from Caerphilly. The mine was long gone, but the sombre associations remained. 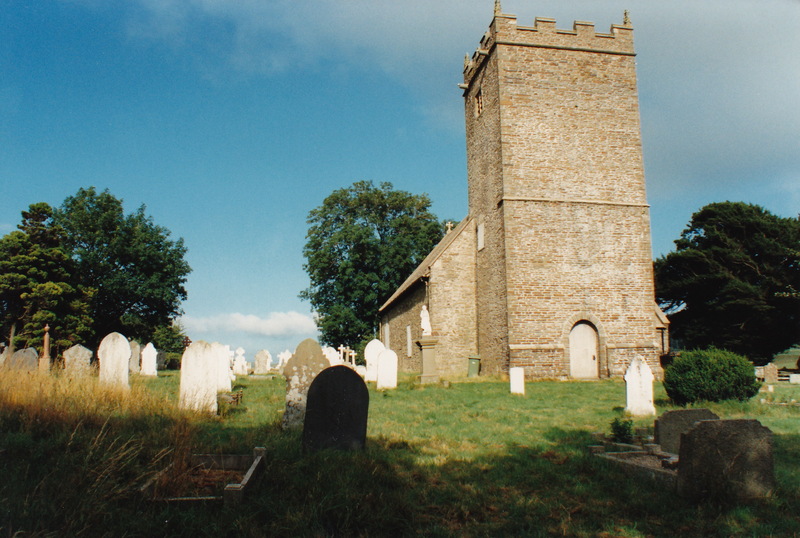 In 1995, I came across the quiet churchyard of Eglwysilan (the name means Ilan’s church) where many victims of the Senghenydd disasters are buried. 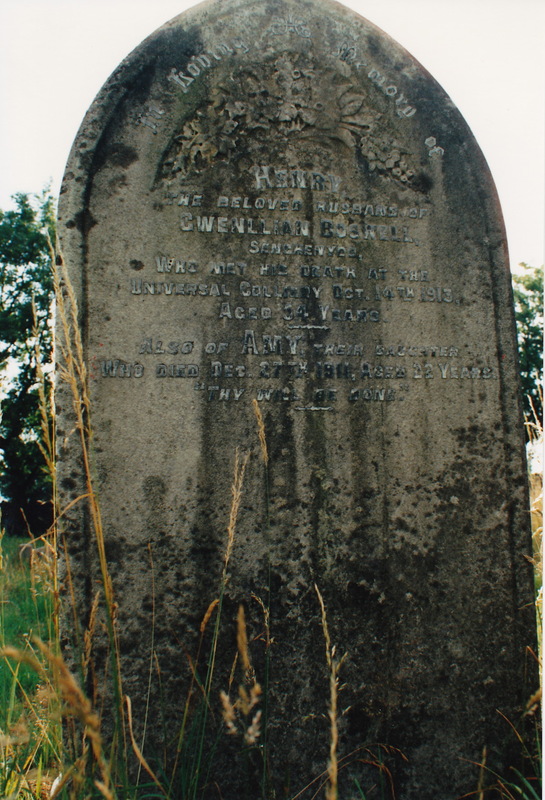 The gravestones are inscribed in English and Welsh, marking the fact that the Welsh language was much more widely spoken in the valleys 100 years ago. I wonder if the grieving wives, mothers and families took some small comfort from this most beautiful of resting places? 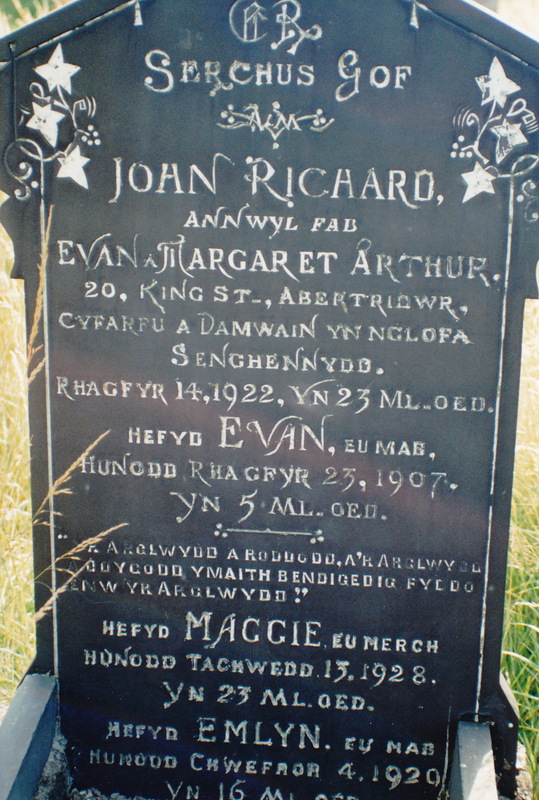 The gravestone shown on the right at the top of this blog post tells the desperately sad story of Evan and Margaret Arthur. It immortalises their son Ioan Richard, who died in an accident at Senghenydd colliery in 1922. It also records the tragically early deaths of three other children: Evan, aged 5, Maggie, aged 23 and Emlyn, aged 16. Were they their only children, I wonder? Tonight, countless families in Turkey are going through the same agonies as the people of Senghenydd all those years ago. This entry was posted in Wales and tagged Senghenydd, Soma mine by Rob Skinner. Bookmark the permalink. There has always (and I suspect there always will be) mining disasters – it’s an inherently dangerous occupation. What we need to do is try to make sure that the safeguards are in place to minimise the risk. All well and good in a first world country (but still there are corners cut, warnings ignored as in Gleision in the Swansea valley in 2011), but how to you ensure this in third world countries, or those where poverty is so severe that desperate people will go to work knowing that they may not go back home at the end of their shifts? And it’s not just mining – many occupations are dangerous and workers need to be protected by robust and enforced safety laws. But that would mean higher prices, and people aren’t prepared to pay them. Ethical businesses lose out to unethical ones who are prepared to cut corners. The deaths at Soma is the latest in a long list of mining deaths – from time immemorial. This is a list of Welsh disasters http://www.welshcoalmines.co.uk/DisastersList.htm. The one that had the most personal impact on me(and, I should imagine, most of the nation) was Aberfan in 1966 when I was nearly 13 – see (http://news.bbc.co.uk/onthisday/hi/witness/october/21/newsid_3194000/3194860.stm. The horror, the devastating sadness in a community will live with me forever (I have a heavy heart and tears welling as I write this) – as this latest disaster in Soma will personally to their community and the Turkish nation.